Ron Ridenour, a veteran journalist and author, former member of the US Communist Party, dedicated anti-war activist and a self-described revolutionary socialist, like Trotsky (though no Troskyite himself) writes from a perspective of outside the city wall. In his latest book, Pentagon on Alert: The Russian Peace Threat (Punto Press, New York, 2018), he does an admirable of job of it too, providing an abundance of readily accessible citations (hot-linked in the book’s online version), instead of some coldly “objective” history. 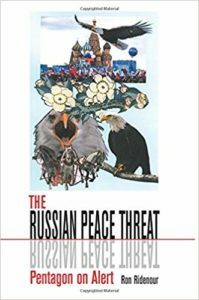 The Russian Peace Threat offers the perspective of someone passionately involved in combating American imperialism and this country’s century-long hostility towards Russia and its revolution against capitalism. He documents how from the outset of the Russian revolution of 1917, when 13,000 US troops joined other European forces in seeking to overthrow the new socialist state by force, down to the present, whichever party was dominant in Washington has sought to hem in and undermine first the Soviet Union and now the Russian Federation. The ultimate aim, he demonstrates, has been to create a client regime in Russia through “regime change,” or to destroy the country with a nuclear first strike. As someone who studied modern Russian history, I found myself nonetheless being continually surprised as I read The Russian Peace Threat, by shocking new facts about this enduring US hostility that I had clearly not been fully aware of. For example, at the end of Chapter 10, writing about the launching of the Cold War by then Prime Minister Winston Churchill and Harry Truman as World War II was ending, Ridenour describes how Churchill proposed a plan to the US called “Operation Unthinkable.” This criminal nightmare vision had the combined forces of the US, Britain and Canada, along with some 100,000 rearmed Nazi troops, attacking the presumably exhausted and over-extended Soviet Red Army then still battling remnants of the Wehrmacht in eastern Germany. Operation Unthinkable, which Ridenour tells us was kept secret until 1998, also envisioned, as early as mid-1945 before the bombing of Hiroshima and Nagasaki, using the new atomic bombs being developed by the US and Britain in the Manhattan Project, against Soviet troops and even on the Soviet capital of Moscow. He goes on in the next chapter about the launching of the Cold War (which he notes was begun not by Stalin, but by Churchill and Truman), to describe how, over the period from 1946-1949, Truman had his Pentagon generals feverishly developing a series of nine equally monstrous plans, more detailed than the thankfully never launched Operation Unthinkable. All nine of these various plans centered on the use of America’s growing nuclear arsenal to completely annihilate the USSR’s industrial base, and its population along with it. With names like Operation Pincher and Operation Dropshot, these plans continued to be developed until 1949, when Russia, thanks in part to the assistance provided by sympathetic Manhattan Project scientists and workers who feared — rightly it turns out! — a hegemonic US with a monopoly on atomic weapons after the war. Even though fanatic Pentagon planners estimated that dropping some 300 nuclear weapons on Soviet military bases and industrial centers could kill half the that war-battered country’s remaining population, it was the only the recognition, in 1949, that the Soviets could finally strike back that halted that active planning (and it was only the lack of a sufficient number of bombs and delivery systems to finish the job that had kept them from launching a “pre-emptive” genocidal war earlier than that). Over and over Ridenour exposes how it has been the US, not Russia or the USSR, that has created the wars and tensions with the Soviet Union. Take Vietnam, which Ridenour, an Air Force recruit himself for a few years before that war really escalated, claims was central to his political evolution as a revolutionary activist. He recounts how the US military in Vietnam was practically in open revolt after the 1968 Tet Offensive. He says following Tet, the smoking of marijuana by US soldiers became widespread as did LSD use, but adds that heroin became the drug of choice. Here he cites the Pentagon as saying that by the early 1970s 15% of Army troops were on smack. He also talks about fragging, again quoting Pentagon sources as documenting more than 900 cases of soldiers using their fragmentation grenades to kill commanding officers they felt were incompetent, aggressive or a threat to their survival . (Note: this number is actually on the low end of estimates of the frequency of this particularly dramatic and deadly act of resistance.) He concludes that these developments, combined with an expanding and increasingly militant anti-war movement and a politically driven end to conscription back in the US, contributed to the US finally losing the war. Not afraid (as are most mainstream academic historians) to wade into the politically contentious present, Ridenour gives a solid account of the current era in which both the Obama and Trump administrations have deliberately increased tensions with Russia, from the coup in Ukraine orchestrated and funded by the US under President Obama and Secretary of State Hillary Clinton, which led to a fascist, anti-Russian government in Kiev, to the current illegal US military role in Syria backing jihadi terrorist groups against the Syrian government, which is being aided by Russia. Ridenour provides a well documented history of the rise of Russian President Vladimir Putin. He explains in detail how the US first helped install the corrupt and alcoholic Boris Yeltsin — a man who allowed US business interests to rob his country blind — in a second term as president and how Putin, at the time a little-known Yeltsin subordinate, at first supported by the US, followed. That support ended when Putin surprised his critics and turned the country around, halted the privatization free-for-all and ended Russia’s headlong plunge into economic and social decline. At that point, Ridenour explains, the US turned on him. There was no “invasion” of Crimea, Ridenour explains. Russia already had 25,000 troops legally based in Crimea under a base-leasing agreement with Ukraine. They were there to defend the Russian naval base at Sebastopol, which was leased from Ukraine under an treaty signed when Ukraine became independent as part of the break-up of the USSR. Crimea, historically a part of Russia, and only annexed to Ukraine in 1954 as a “gift” ordered by Russian Premier Nikita Khrushchev, himself a Ukrainian, was 68% ethnically Russian and only 16% Ukrainian. When the people of Ukraine expressed a desire to have their territory returned to Russia because of threats against ethnic Russians from the new Kiev government, a plebiscite was held. The result: 83% of eligible voters cast ballots, and 97% of them favored reintegration with Russia. Putin agreed. That was the “invasion” that the US and other Western media continue to refer to ad nauseam. Ridenour, quoting Western sources, says the “invasion” in truth only involved Russia sending over to Crimea six helicopters and two small boats with 500 so-called “little green men” — actually Russian Special Forces acting as “polite police.” The Ukrainian garrison in Crimea was given the option of leaving or fighting, and in the event many, including senior officers, defected to Russia, while the rest of the garrison left for Ukraine peacefully. While Trotsky may have disparaged the use of anecdotes in his History, Ridenour, who spent eight years living in Cuba (he famously burned his passport and renounced his US citizenship after the US launched the Gulf War against Iraq, throwing the ashes at the US Interest Section compound in Havana, eventually moving to Denmark where he now lives), provides many anecdotes, some critical, about his life in Castro’s Cuba. He also recounts his experience as a US Airman stationed in Japan, and about his experience as an activist in the US. These accounts enrich the book and allow the reader to understand where the author is coming from. That’s the Ron I remember from the days back in 1976 when he and several other Los Angeles journalists, myself included, founded a feisty if short-lived worker-owned-and-run alternative left news weekly, the Los Angeles Vanguard. 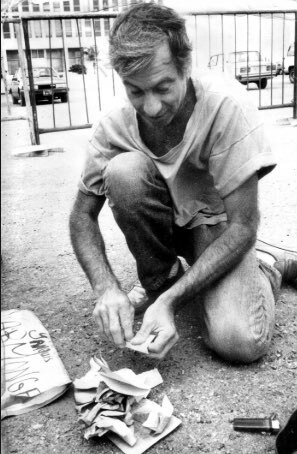 A committed socialist revolutionary, Ron has always been radical journalist, an excellent writer and a passionate believer in the pure evil of war and in the need for a re-ordering of global society on the basis of real socialism, not capitalism or welfare-statism. His book The Russian Peace Threat is a must-read for anyone who wants to understand what is driving the insane US effort to gin up a new cold war with both Russia and China at a time when the real threat facing humanity is of either nuclear annihilation or the destruction of the very planetary ecosystem that allowed the human species to evolve and thrive. As Ridenour meticulously documents, mostly drawing on western news sources, from the end of World War II the US has been the driving force for increasing enmity between itself and first the Soviet Union and today Russia (and increasingly towards China too). It is also the US, not Russia, he writes, that has been responsible for tens of millions of mostly Third World deaths since the end of that last horrific global conflict. Dave Lindorff writes for ThisCantBeHappening!, the independent Project Censored award-winning online alternative newspaper where this article first appeared. Read other articles by Dave. This article was posted on Thursday, October 4th, 2018 at 5:58pm and is filed under Book Review, History, Militarism, President Vladimir Putin, Russia, The Soviet Union, Ukraine, United Kingdom, United States, Viet Nam.